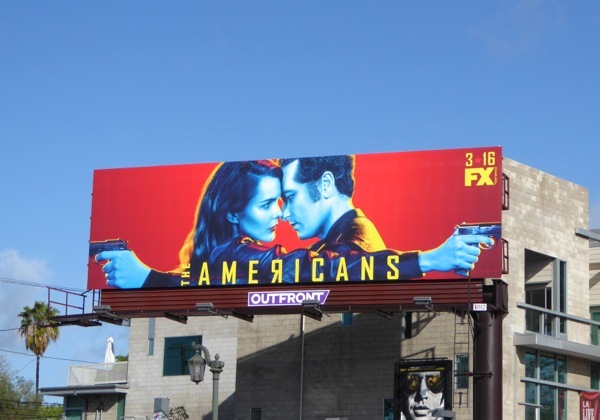 The Americans have done it again, come up with another compelling promo billboard to get viewers excited for a new thrilling season. From the looks of things these 80s KGB sleeper agents, played by Keri Russell and Matthew Rhys, have each others backs (and their chemistry has been ramped up even more knowing that the onscreen married couple are dating and expecting a child together in real-life). 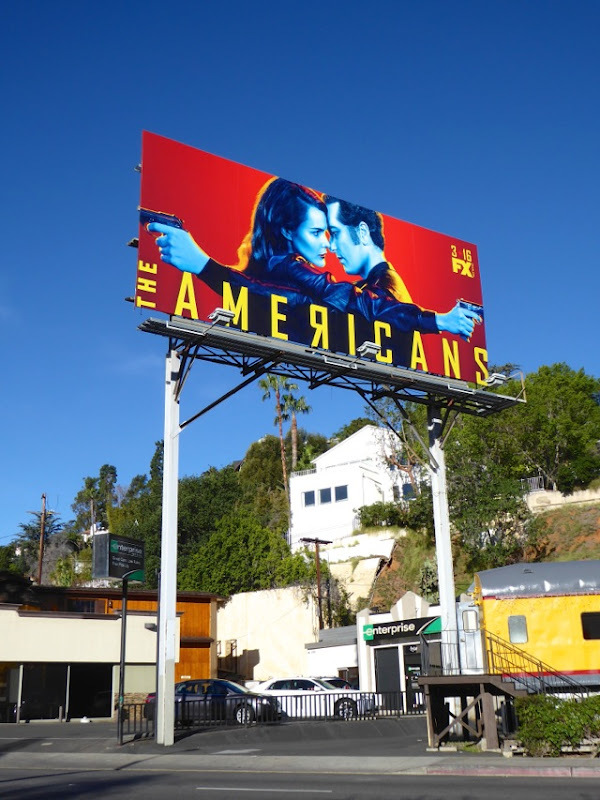 The third season of The Americans was arguably their best to date, with the 'Jennings' faux all-American family starting to show a few cracks. Their onscreen daughter 'Paige' (Holly Taylor) finally knows their secret (and blabbed to her pastor about it) and her parents are desperately trying to keep the Soviets from recruiting her. Rhys' 'Philip Jennings' struggled to handle all the women in his alter-egos lives, be it seducing a teenager to gain access to her spy father's house, or handling Alison Wright's 'Martha' when she discovered that her husband 'Clark' wasn't who she thought he was. Meanwhile Russell's 'Elizabeth' was surviving a DIY tooth extraction, recruiting South African assets and trying to help her daughter understand where she comes from by taking her to visit her sick grandmother. 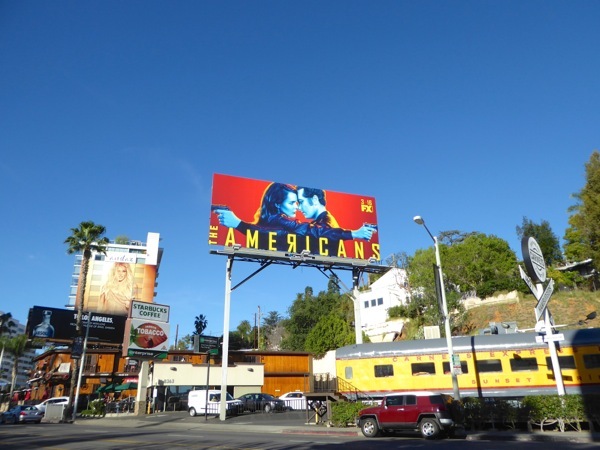 This striking fourth season billboard, with its bold red and yellow Soviet Union colours, was snapped along West Hollywood's Sunset Strip on February 15, 2016. 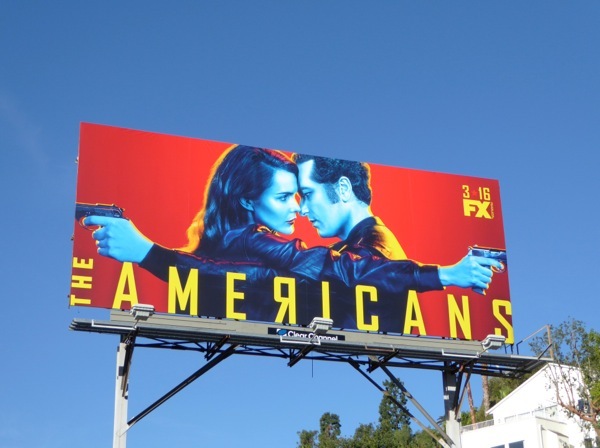 If you're a fan of the show, be sure to also check out these equally arresting previous season promo billboards for The Americans. Mole hunts and FBI next door neighbours, KGB double-agents, old friends and new foes, duty versus family, plus people stuffed into suitcases. 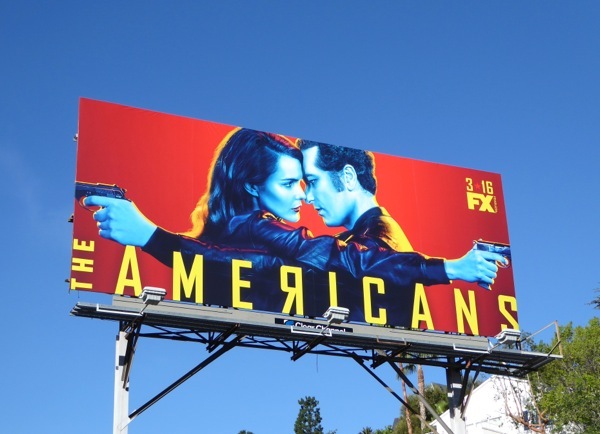 Let's see how The Americans can continue to wow us this season. 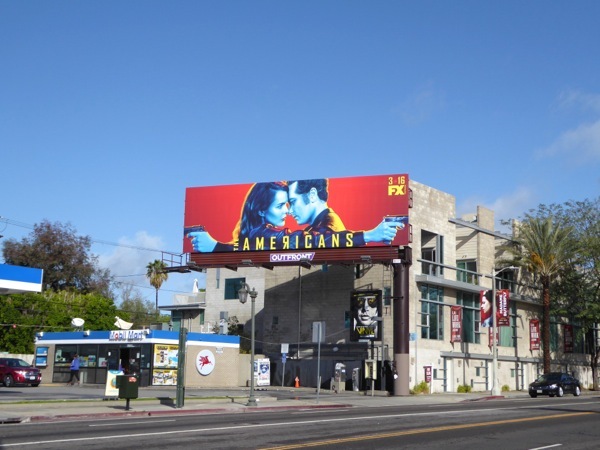 UPDATED: Here's another version of the season four billboard looking just as impactful at the intersection of Melrose and Highland Avenues on March 6, 2016. They may be KGB spies, but it's hard not to root for this undercover couple, no matter how brutal or deceptive they may sometimes have to be. 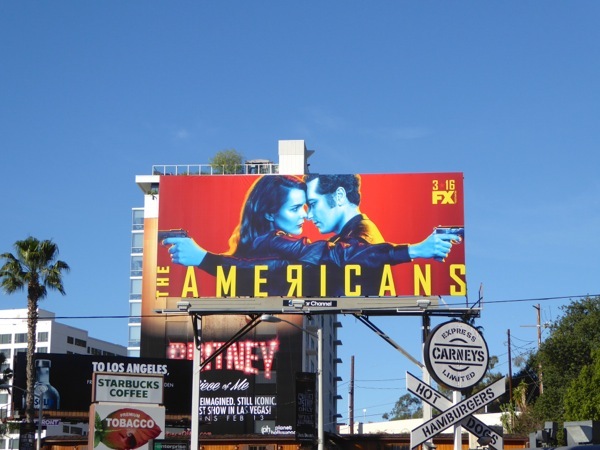 UPDATED: Here's also an adapted season four billboard as part of FX's 2016 Emmy consideration ad campaign, snapped along Sunset Boulevard in West Hollywood on May 3, 2016. 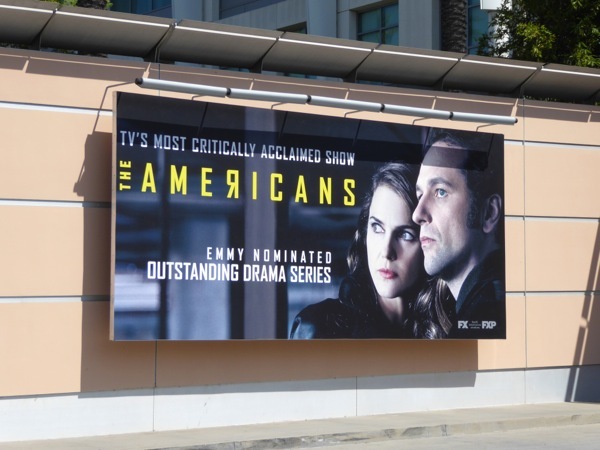 UPDATED: Finally The Americans received some Emmy love this season and garnered five nominations, including one each for the lead actors, a nod for Margo Martindale as guest actress, for writing and Outstanding Drama Series. 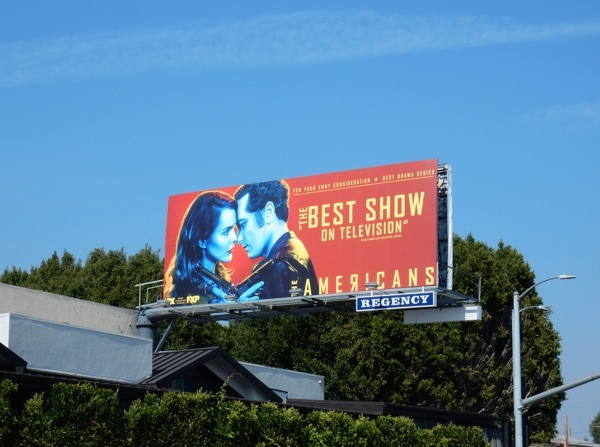 This Emmy nomination billboard was spied at Fox Studios along L.A.'s Pico Boulevard on August 22, 2016.